The most accurate Enfield / Somers town map available online. Welcome to The Town of Enfield, Connecticut, a suburb located in Hartford County, eighteen miles north of Hartford, Connecticut and eight miles south of Springfield, Massachusetts. 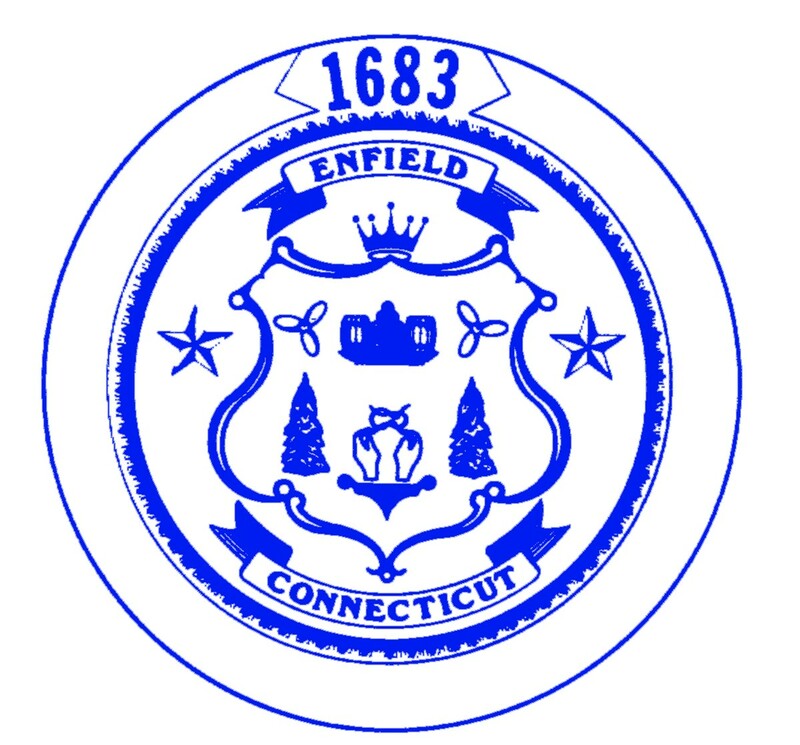 Enfield was named and incorporated by the Colony of Massachusetts in 1683 and annexed to Connecticut in 1749. The town is 33.8 square miles with a current population of approximately 45,246. Enfield 's Town Seal is in the shape of a shield, enclosed in a double circle with a compass like border. At the very top, the year the town was named and incorporated by the Colony of Massachusetts. The town name, Enfield, is inscribed in a scroll contained within the double circles and border, under the year. The shield is under the scroll, within the circles and border. At the top of the shield is a five point crown, the trademark of Hallmark Cards Inc. Directly below the crown, within the shield, is a pile of cannon balls with a keg of gunpowder on each side, representing the Hazard Powder Company, a manufacturer of gunpowder during the Civil War. A three-bladed propeller is on either side of the powder kegs symbolizing the Crestline Boat Company, a subsidiary of the Bigelow Sanford Company. The Bigelow Sanford Company trademark, a weaver's knot tied by a pair of hands on a pedestal, represents the nation's largest carpet manufacturing company at the time. A tobacco plant flanks each side of the trademark depicting the Tobacco Valley in which the town is located. A star on each side of the shield, centered within the double circles and the border, stands for the Colony of Massachusetts and the Colony of Connecticut. A bottom scroll is inscribed with the state name, Connecticut. Settlement here in "East Enfield" was started about 1706 by Benjamin Jones, with other settlers, Edward Kibbe, James Pease, Timothy Roote, and John McGregory, following in 1713 . 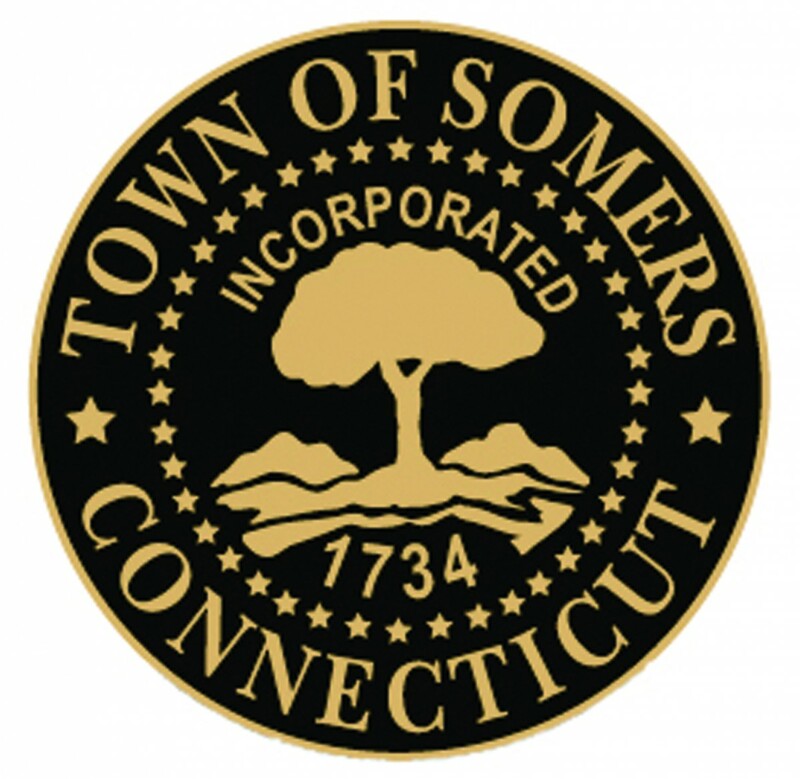 The Town of Somers was incorporated in 1734 by the General Court of Massachusetts and named for Lord John Somers of England. In 1749 Somers separated from Massachusetts and was annexed to Connecticut. Somers has always been an agricultural community with potato, tobacco and dairy farms. The Four-Town Fair was organized in 1838 as a contest to see which of the ten school districts had the most oxen. "Little Sorrel", the favorite horse of Civil War General "Stonewall" Jackson, was born at the Collins Farm on Prink Street, now Springfield Road. Industries have included grist- and sawmills, and bonnet making. In 1839, the Billings Satinette Mill was established on the Scantic River. Rockwell Keeney purchased it in 1879 for a woolen mill. As the Somersville Manufacturing Company, it was the main industry here until 1970.